Despite sharing classified data, the Australian submariner community remains skeptical of the Soryu-class submarines. As the competition over Australia’s biggest-ever arms deal is heating up, Tokyo announced yesterday that it will share classified submarine data with Australia, Reuters reports. This unprecedented step — Japan has previously only shared classified technical data with the United States — is a clear signal that Tokyo intends to join the competitive bidding process for a $39 billion contract to build Australia’s new submarine fleet in partnership with Australian industry. and their position on commercial issues such as intellectual property rights and their willingness to share technical data with Australia. Japan, with its brand new 4,000-ton Soryu-class stealth submarines all outfitted with a new lithium-ion battery propulsion system, appears to be the frontrunner, with the German company ThyssenKrupp AG (TKMS) the second choice, mostly due to its experience in submarine exports. France is not seen as a serious contender. All three bidding countries have agreed to build the submarines in Adelaide, the home base of Australian Submarine Corporation (ASC). Sweden was not invited to bid for the contract, despite protests from Australia’s federal opposition. The SAAB group, a Swedish aerospace and defense company, also built Australia’s Collins-class submarines, currently in service in the Australian Navy. As I noted back in March, the Collins-class submarines experienced a succession of problems right from the beginning, including unreliable diesel engines and an ineffective combat system. Japan is still deemed the unchallenged front-runner in the weapons deal. In March, Tokyo indicated that it may be softening its stance vis-à-vis the possible construction of Soryu-class submarines in Australia, eliminating a major hurdle. Japan is generally reluctant to transfer military technology abroad, but Australia expects to submarine contract to create around 500 new jobs in the country — mostly in South Australia. At Australia’s Future Submarine Summit, held in March in Adelaide, retired Japanese Vice Admiral Yoji Koda stated that perhaps only the first out of a dozen such vessels would be built in Japan (see: “Will Japanese Subs Be Built in Australia?”). However, the two Japanese companies building the 4000-ton Soryu-class vessels, Mitsubishi Heavy Industries and Kawasaki Heavy Industries, were notably absent from the event. The Australian submariner community remains skeptical of the Soryu-class submarines. Among other things, they point out that on average Japanese subs are constructed to last for around 19 years, whereas the Australian governments expects at least a 30-year active service life span. The Japanese boats also have much less accommodation space than Collins-class submarines. Additionally, the much talked about air-independent propulsion (AIP) system is actually Swedish technology. However, the Australian government has so far not shown any interest in AIP, preferring a lithium-ion battery option, which will be built into the next batch of Soryu-class subs. Nevertheless, advanced lithium-ion batteries are one of Japan’s top military secrets and it seems unlikely that Tokyo has agreed to share this sensitive technology with Canberra despite media reports. The Japanese subs also allegedly have less range than the current Collins-class submarines in service. 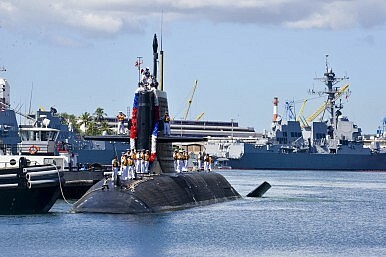 Furthermore, another concern is the integration of a U.S. combat system and weapons ( Mk 48 Mod 7 CBASS heavyweight torpedoes) into the Japanese hull. In November 2014, Australia’s Senate Economics Legislation References Committee, rejected the Japanese submarine as an option. Did Japan Just Lose the Bid to Build Australia's New Subs? The Australian government has allegedly ruled out Japan's sub bid, according to an Australian media report. A naval parade to honor the 70th anniversary of the creation of the Chinese Navy included the service’s latest destroyer class.